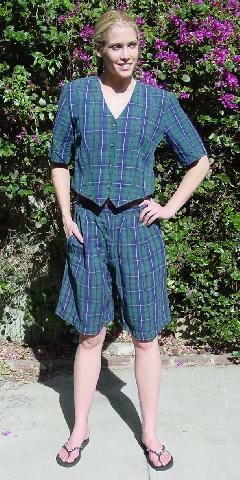 This plaid blouse and walking shorts are 55% linen and 45% cotton and were made in Romania. The outfit is in dark blue-violet, forest green, dark blue, and red. The collarless blouse has a V neck and 4 marbelized blue-green buttons down the front. It has a vest styling. 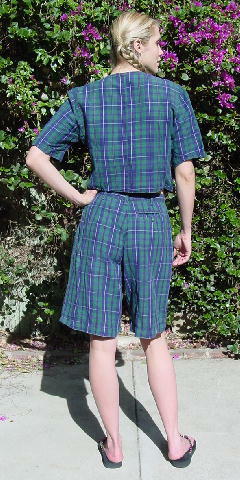 The shorts have belt loops and a 6 3/4" front zipper. It has deep side diagonal pockets and a back pocket with a one button closure. shoulder to end of sleeve 11"